Ideal for filled resin applications. THE ONLY GUN with built-in Shut Off Valves for easy maintenance. Environment friendly-keeps you in compliance. Welcome to the next generation of FRP gun technology: Introducing the MVP DuraMAX gun. The new DuraMAX gun is the peak of power, versatility and lightweight design. Now you can deliver filled resins, high volume applications or standard chopping/saturating flow with ease, precision and efficiency. The reduced gun head weight and balanced handle/trigger put the weight of the gun further back over the hand for a distinct ergonomic difference. Due to the simple yet efficient design, the DuraMAX is lighter than our competitor’s guns. For reliable performance, the catalyst valve has been designed to use a conventional needle and seat, using the same packings on both the catalyst and resin valves. The MVP DuraMAX gun incorporates Rapid Access Design (R.A.D.). With fewer parts and maintenance-friendly access, routine replacements take only minutes. 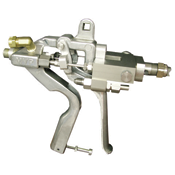 This rugged gun features a carbide needle and seat (standard), and is the only gun on the market with built-in shut-off valves for resin and catalyst. Now you can perform maintenance without the need to drain pressure or remove hoses. Keep your environment clean & efficient: Utilizing MVP’s patented FIT, the MVP DuraMAX gun less overspray, easier clean-up and lowest emissions on the market. The results are significant material savings (over conventional spray applications), and government EPA conformance.